The #1 soft skill companies want in 2018 according to a LinkedIn study of over 2,000 organizations is … leadership! Really, where have all the leaders gone? Lee Iacocca wrote a book about that subject 10 years ago. I remember reading it and it looks like leadership is still in demand. If supply is not meeting demand, then what are you doing to heed the leadership call? What are you doing to prepare for that next project leadership role? Is jumping into a supervisory role on your agenda? Are your leadership skills ready for the next management opening? If you are already in management or even in a C-suite position, are your leadership skills good for the long haul? The LinkedIn article I mentioned above assumes leaders have another skill, the skill of strategic thinking. So, leaders need to understand how to lead but also have to be good strategic thinkers? How and where do you practice these skills? Airplane pilots use simulators to learn how to land a plane with one engine and a hole in the fuselage. Surgeons practice on cadavers to increase surgery precision. For business people, the same hands-on procedures just don’t apply. So are you out of luck? No. There is a way leadership and strategic thinking are practiced with incredible focus, giving chiefs-in-training an incredibly incisive edge. And believe it or not, that resource has existed for over 1,400 years and is used all over the world. It’s a game, learned in school but often left behind in the frenzy of adulthood. I’m talking about the game of chess. If chess is presented in terms that business people understand, it can be readily applied to developing and maintaining many of the critical skills needed to run a business. In Tom Peters new book, “The Excellence Dividend: Meeting the Tech Tide with Work that Wows and Jobs that Last,” he opines that whoever screws the most stuff up wins. It sounds contradictory, but that truth has played out in countless ways for centuries. So it is with chess. A wide-eyed newbie can study strategy, but until they see a move play out—and the consequences it reaps—they won’t understand how to build on or amend that strategy to move their pieces even further the next game. That means losing a handful of times. And if you’re in the game to become better, then you’ll happily endure a few knocked-down kings. Let’s take this a step further. 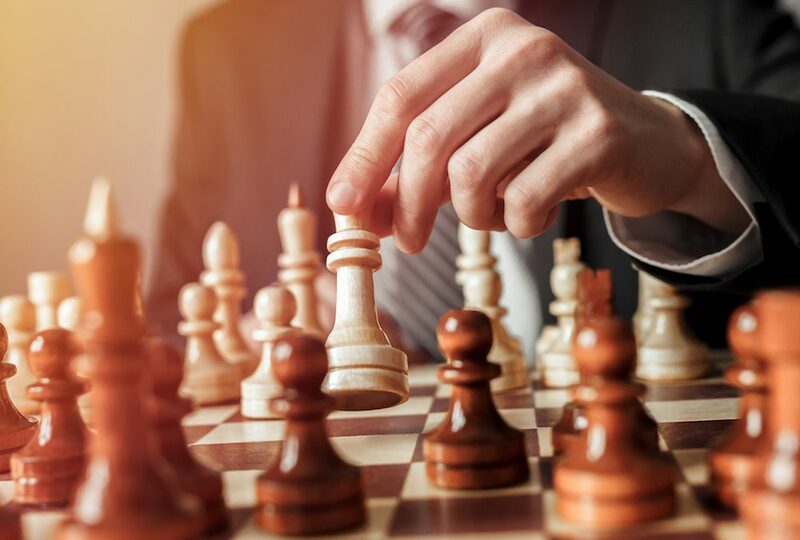 If chess is an effective way to map out company decisions as a leader, it stands to reason that playing an ACTUAL game of chess would allow you to play out different scenarios without the danger of loss. Let’s see what that would look like. Every chess game is an opportunity to practice the full run of a decision. This is especially beneficial to entrepreneurs and startups that are spending a lot of human and financial capital on breaking on their market. So what move is the right one to make? By assigning each piece on the board a resource that your company has in hand, you can play out how that resource would work when it engages with competitor resources (opposing pieces), how it might be supported by investor capital (your own royalty pieces), and what happens when you move it in various directions on the board. Does it get in the way of other resources? Does it make it possible to defend more valuable resources? These “resources” can be anything—employees, money, products, physical assets, etc. The process of working through a bird’s-eye-view, strategic game like this informs your ability to be a transformational leader. In other words, it gives you the strategic, long-term vision that enables you to make decisions that are the best for your employees, your company, your investors, and your customers. You transform the entire business into something more beneficial and more profitable. But there are other benefits to chess practice, too. While you may have a longterm vision for your company, playing out a full game of chess with representational pieces forces you to play the role of a situational leader. It puts you in the hot seat with consequential questions, like, “If I move my Queen (my hot-button product) to a space two spaces to the right (a different distributor), will I be better protected or more limited in my reach and impact?” Moves like these for you to think on the spot, taking into consideration all of the pieces on the board. Finally, your business needs a clear vision for the endgame. This is where results-based leadership comes in. You have to know what the most important pieces on your board are, so that you know what’s okay to sacrifice and what compromises are necessary. It’s not always about “winning” every move, but winning the long game. Be a leader that takes action; find the chess pieces you have buried in the house and bring them into the office. Set up a game in the lunch room or conference area with a sign saying: “Looking for a leadership challenge, you up for it?” Don’t laugh; I’ve been onsite and many of the new-age workplaces have billiards, table tennis, and chess set up ready for a challenge. Alternately, just have one in the corner of your office that you can play by yourself. Get accustomed to mapping out company strategy using the pieces on the chess board. And when you don’t have a partner, play both sides. It will force you to see your company from the competitors’ perspective. You can also jump on chess.com and set up a free account, though having a physical chess set is my preference. Understanding the dynamics of chess can accelerate your company’s competitive position. They help you hone your skills as a transformational, situational, and results-driven leader with a thorough understanding of your company’s position and potential. With plenty of practice, you’ll find yourself winning game after game in the lifelong tournament called business. Strategize your mornings for better productivity using the CEO-vetted Morning Routine! J.K. Egerton is the CEO and founder of Business on the Board, a leading-edge talent development company that uses a game-based approach with business strategies and tactics. His book, Business on the Board, is a #1 management self-development bestseller that reveals how business and chess are related. It’s available nationwide. Learn more at chess-now.com.